One of New Zealand’s most highly respected abstract artists, Milan Mrkusich, designed several large public artworks in Auckland in the 1950s-1960s. The most well-known existing ones include the mosaic mural on the B. J. Ball Building overlooking Fanshawe Street, and the stained glass windows at Grey Lynn’s St Joseph’s Catholic Church - the largest abstract work in the country at that time. Ref: Patrick Clearwater, BJ Ball mural, 31 May 2010. B. J. Ball (NZ) Ltd was a paper manufacturing company and Mrkusich’s mural for them highlights the paper-making process from the raw material of trees to the end product of stacks of reams. 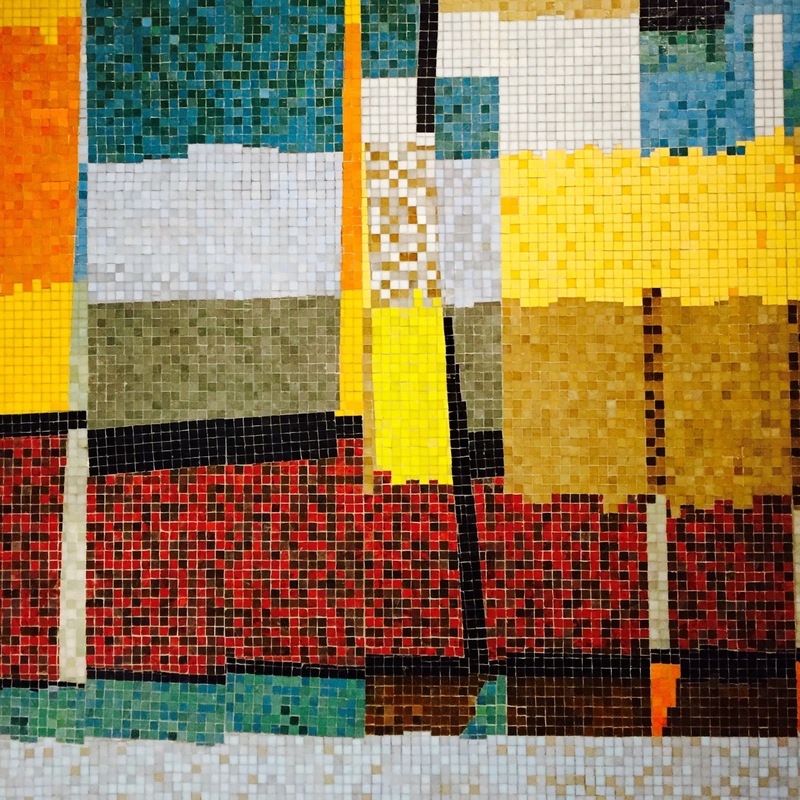 This mural is 7.6m high and 3.9m wide (25ft x13 ft.) and is made from thousands of glass and ceramic tiles. As Julian Dashper recounts in a 1995 article, Mrkusich made full size plan drawings “which he rolled up and posted to Italy, where a master tile maker made a complete mural on the floor, turned it upside down into hundreds of little boxes and sent it back to New Zealand” where it was assembled (“An Artist’s Look at Auckland’s Public Art”, Modern New Zealand, No 1, p 2-9, 1995). In 1997 the Historic Places Trust notified a plan to give the B. J. Ball Building a category one listing on the historic places register partly because of the mural’s artistic significance (NZ Herald, 4 March 1997, A9). 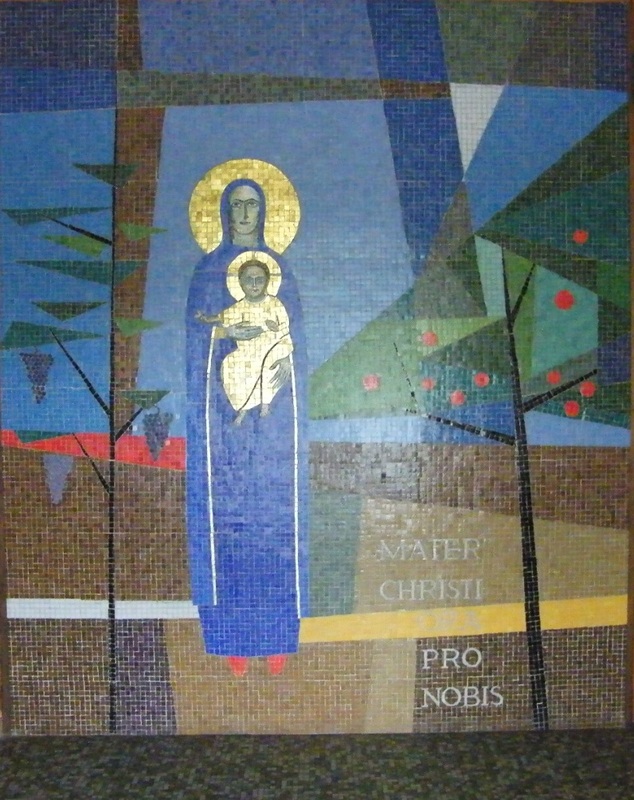 Mrkusich designed this mural in 1959, the same year that he designed the 14 Stations of the Cross panels for Henderson’s Catholic Church of the Holy Cross. 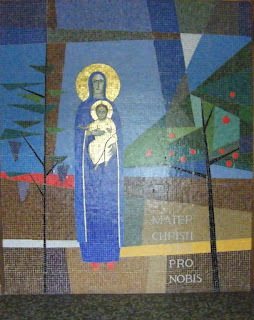 He also designed a mosaic in the church entrance depicting Mary and Jesus, with a background featuring fruit trees and grape vines symbolising the district’s horticultural history. These works, along with others in the church by Louise Henderson, were salvaged in 2008 and reinstalled as part of a $3 million extension of the Church, as they were considered to have exceptional cultural and monetary value. Ref: Mary mosaic, Holy Cross Parish Henderson. In 1960 Mrkusich created the mosaic frieze “The Way of the Cross” for the walls of St Joseph’s Catholic Church in Grey Lynn. He also designed 185 square metres of vibrant stained glass windows where Christian symbols such as the Resurrection of Christ and Christ’s crown of thorns are shown in an abstract form. In 2004 Mrkusich told Heritage New Zealand (2004, 94:47) that the designs “were very modern for the time. They are even modern now.” There are eleven main windows including; The Fire Window of reds and oranges symbolising martyrdom; The Water Window’s blues and greens symbolising the washing of sins; and the Window of Sorrows symbolising Christ’s suffering. A Samoan Po Siva (night dance) was held in 2008 when the church began fundraising for maintenance projects that included resealing the windows. Ref: St Joseph's Catholic Church windows, 30 July 2010, copyright Timepsanner. Ref: Mural in Chelsea Sugar Refinery Building, Fort Street, July 2016. In 1964 Mrkusich designed two stained-glass windows for the Chapel of St Andrew in Quay Street’s Seafarers’ Memorial Centre. These were salvaged before the Chapel was demolished in 1993 and are now permanently installed in the NZ Maritime Museum’s Edmiston Gallery of Maritime Art on the Viaduct. Mrkusich was born in Dargaville in 1925 to Dalmatian parents who had emigrated from Podgora, two years later the family moved to Auckland. Mrkusich began painting in the 1940s inspired by modernist art he found in the only art-sources available at that time - magazines and books, including a book on the German Bauhaus school of architecture and applied arts held at the Auckland Public Library. In 1946 he painted New Zealand’s first abstract painting, and in 1949 he became a partner in the Bauhaus-influenced architectural and design firm Brenner Associates. Mrkusich has been a full-time painter since 1958. In 1997 he was made an Officer of the NZ Order of Merit (ONZM) for his services to painting, and in 2003 was awarded the status of Icon Artist by the Arts Foundation of New Zealand.